"What is everyone's best military woking momma life hack? What is the one thing that keeps you sane?" 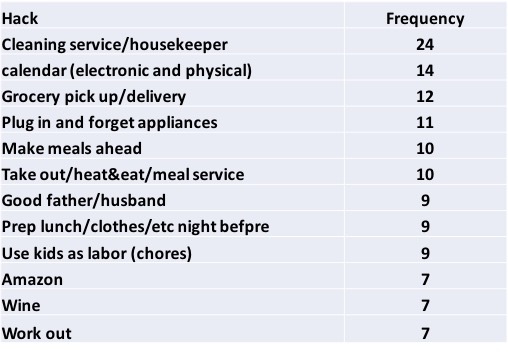 In raw numbers, far and away the most frequent hack was hiring someone to clean your house. For many this is a tough hurdle - partly because showing your mess to someone else is a vulnerable spot to be in, and also because it seems a little first-world-privilage-y. But especially when your kids are little (and if you have pets) this is an incredibly worthwhile investment. Second was the need for a family calendar - some suggested electronic to be shared with spouses/kids (Google was the most popular), some suggested old school white board. For our family with a parent that travels frequently, this was a life saver. Nothing makes me feel overwhelmed like not having the calendar organized. 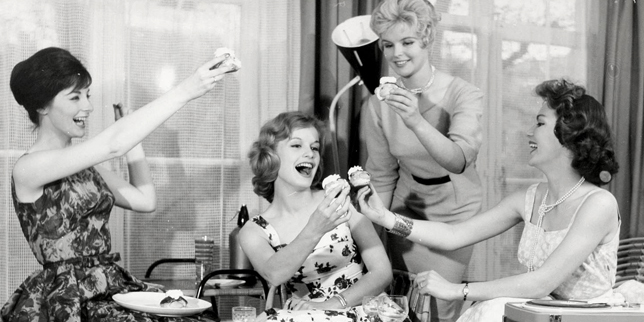 Several other top hacks, as you see, had to do with food. If only there had been grocery delivery when my kids were toddlers, it's stinkin' genius. That, Amazon and an Instant Pot seems to be the way to make it work for many of the commenters. I enjoyed the comments about making sure you pick out a good husband/father, and getting your kids involved in keeping the household running by giving them chores. Everyone has a different life situation, but making it a team effort as much as possible definitely helps. I wanted to look at the "data" another way, so assigned each group of comments to the categories of Organize, Outsource, Good Decisions, Automate and Simplify. The results are in the bar graph at the top. 1. Dressing kids: pick clothes either the night before, pick clothes for the week on Sunday, or when things get busy, let the kids sleep in their clothes. One mom puts her baby in clean clothes after the night time feed and change. Genius! 2. Using time well: using your lunch or kid free time to get shopping and other errands done, and my favorite, having kids eat breakfast in the car during the morning commute. 3. Having a laundry system: how to design the system depended on what worked for individuals. Some use a load-a-day plan, some use the once-a-week plan (and buy the biggest washer/dyer possible), some do each persons one at a time as their baskets get full. Definitely a plan of some kind helps keep the ocean of dirty clothes tamed. 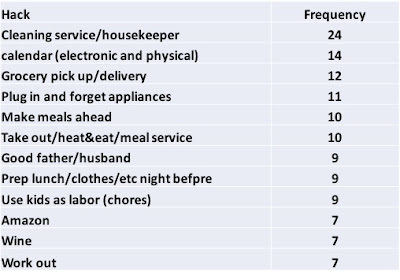 The most popular tasks to outsource were hiring a house cleaner and using grocery delivery, as well as having the kids help with chores, having a good baby sitter/nanny (sometimes tough to come by), and buying prepared meals - either take out, heat and eat, or a meal delivery service. Definitely picking a good partner is a key good decision. And getting parenting classes to up your expertise was a great suggestion. The rest of hacks were self care, either mental (turning to your faith or letting go what was beyond your control) or physical (getting sleep, working out and enjoying adult beverages when necessary)(and they are necessary). Using the inter webs to automate what you can, like the Amazon subscription service and grocery pickup/delivery, saves time, as well as appliances you can plug in and forget. The Instant Pot was the clear favorite, as well as crock pots and air fryers. And for those not quite ready to out source housecleaning, a Roomba is highly recommended. Finally, a number of hacks fell into the simplify category. Using paper go cups for coffee and paper plates for dinner are little things that take cleaning chores off of your list. Buying a smaller/closer house and downsizing your stuff takes a bit more strategic planning, but the time you get back would be well worth it. By far the one I need to be reminded of is being realistic with kid activities. You can sign up them up for Scouts, a musical instrument, Odyssey of the Mind, and a travel team sport, but should you? 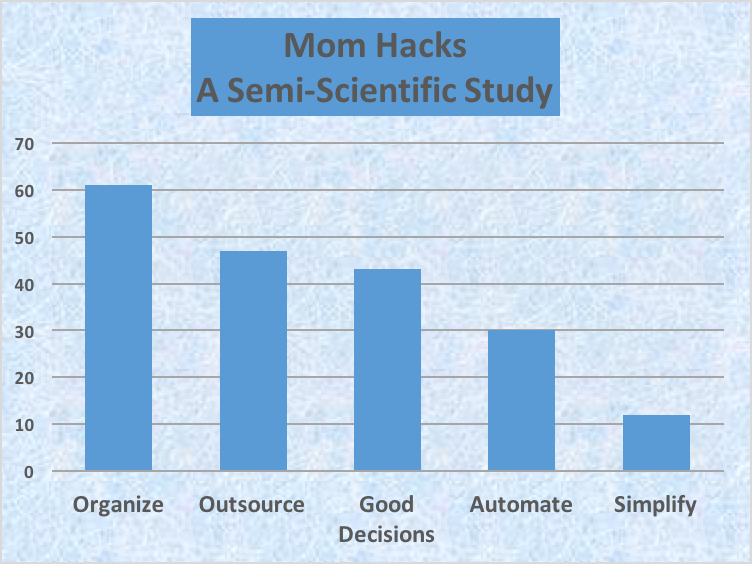 The biggest thing I learned from this call for hacks was that you are never alone, mommas, just reach out and ask. Not every idea out there will work for you, but it sure helps knowing there are others out there trying to figure it out like you are.